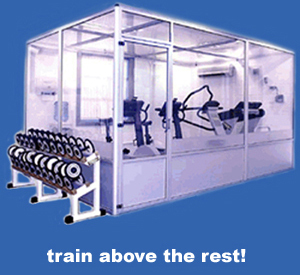 Hypoxico, Inc. is the World Leader in Altitude Simulation Technology since 1996. The patented Hypoxic Room System, or HRS, is World's first altitude training system to provide a simulated high-altitude environment for exercise. By safely generating a controllable oxygen level equivalent to an altitude of 21,500' feet - the HRS allows you to quite literally "train above the rest". Our two systems: HRS for Health Clubs and HRS for Pro Teams provide fully customizable altitude training solutions for commercial gyms and professional sports teams. ©2008 Hypoxico, All rights reserved.